Professor Jobb Arnold and I, along with our respective partners, recently travelled to Standing Rock Reservation, one hour south of Bismark, North Dakota, to offer our support for the protest against the Dakota Access Pipeline and to bear witness. We camped at one of three camps for the supporters. They called the supporters "water protectors" because one of their main concerns is the potential for harm to the Missouri river, as the pipeline is to pass under it. There were about 1,500 protesters in the camps when we arrived, but we were told that a month earlier there were 7,000. The entrance to our camp was flanked by flags from the many reserves and nations that support the protest. We were impressed by infrastructure, which included a medical centre, a kitchen which supplied hot food for the supporters, a gathering place where people drummed and sang into the night around the fire, and a nonviolence training centre. There was a very good spirit in the camp. The commitment to nonviolence was strong. We showed up for the nonviolence training thinking we would learn more about the camp, because we considered the camp to be itself nonviolent resistance. But the training was for those who were willing to commit civil disobedience at the construction site. The trainers talked about the tanks, sound canons, tear gas, rubber bullets, and attack dogs that had been used on protestors. Before the training on legal issues was finished, there was a call for the water protectors to go to the construction site. In our circle, almost all of those willing to be arrested were non-indigenous allies from across the country. We have so much admiration for the strength of the people of Standing Rock who are leading this environmental protest at great cost and with great difficulty. It is challenging to have so many of their allies trying to take control of the movement. They are preparing to winterize the camp now so they can stay for however long it takes to protect the river. We wanted to go observe because we are concerned about the media coverage and/or lack of it. The militarization of the police force is very concerning, too. Just before we reached the camp, we were stopped, questioned, warned, and photographed by the National Guard. We passed through the roadblock and came to the location at the side of the road where the construction of the pipeline had halted. There was a small encampment there and hundreds of flags tied to the fence. There, we were welcomed and learned about some conflict within the movement (typical of social movements-many different perspectives from many passionate people). We took pictures and headed to the camp, where a police helicopter hovered overhead all day long, watching us. 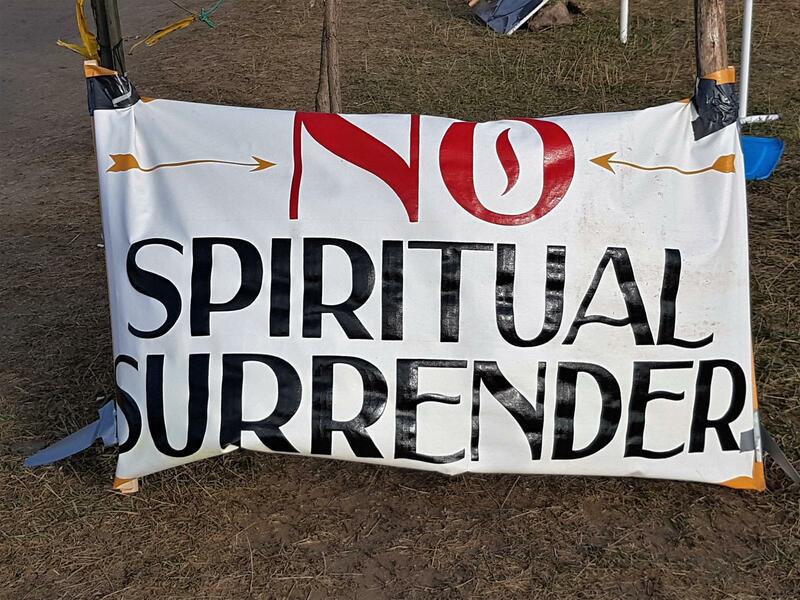 The following morning about 5:00 AM, there was a call over a loud speaker in the camp for the water protectors to go to the construction site, because the court injunction had been lifted. Going to the protest site meant likely arrest. About 100 people went that morning; 27 were arrested. Among their number was actor Shailene Woodley, who live-streamed the process. Within a few hours, it had 3 million views.